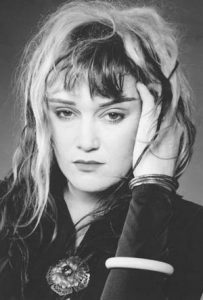 “Exene Cervenka has transitioned successfully through a variety of career phases, starting with her stint in X, the band that perhaps best embodied the character of L.A.’s punk subculture of the early ’80s. “She moved on to the rootsy folk-country side project the Knitters with other members of X and the Blasters, then launched a solo career that included spoken-word performances of her own writings. “In the last decade, she started taking her interest in visual art seriously to the point of regularly exhibiting in galleries around the country. “I’ve got to say that like a lot of people who have something really bad happen to them, it’s a blessing and a curse,” she said. “I’m learning a lot about people, about my friends, my family, about me. “I’ve completely changed my lifestyle around to be healthier, and I think it’s one of the things that’s helped me make a leap forward, hopefully. It’s kind of platitude-ish, but you always want to be a better person. Excerpted from Keeping up with Exene Cervenka, By Randy Lewis, Los Angeles Times October 6, 2009.